Do you, like most people, believe that “creative genius” is strictly a matter of genetics? You either have it at birth, or you don’t? Or that creativity is inextricably tied to unusually high intelligence? Those are key myths refuted in “The Creative Curve” by Allen Gannett, founder and CEO of marketing analytics firm TrackMaven, whose clients have included Microsoft, Marriott, Sakes Fifth Avenue, Home Depot, Aetna, Honda and GE. The book, just released on Tuesday by Penguin Random House, distills insights from scientific findings and recent interviews with noted creatives across fields to enable virtually anyone, across endeavors and disciplines, to methodically tap creativity and generate ideas with strong potential for commercial success. Gannett highlighted those insights and methods to kick off a morning of sessions focused on harnessing innovation to boost publications’ performance at retail, during the 2018 Magazines & Books at Retail (MBR) Conference on Tuesday. 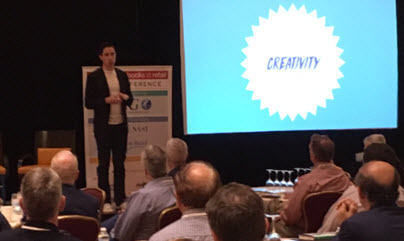 His motivational talk, like his book, used relatable and often surprising case studies — ranging from the team behind the Broadway hit “Dear Evan Hansen” to the chief content officer of Netflix and Michelin-rated chefs — to convey the background and concrete, practical steps. For survival, evolutionary processes hard-wired humans to have two contradictory urges, he explained. On one hand, we crave familiarity, for safety reasons (such as returning to a safe, familiar cave). On the other hand, we crave novelty, for potential reward (such as tasting a new plant as a potential food source). Regarding intelligence, he reports that scientists have found that, once a threshold of an IQ of 104 (an unexceptional score) is present, there is no correlation between a higher IQ and higher creativity. Meaning that everyone with an IQ of 104 or higher has the same creative potential. Gannett also delved into two of four proven “laws” of enhancing creativity laid out in the book: consumption and imitation. It turns out, he said, that people we consider “great creators” actually spend about 20% of their time each day consuming information or content that applies to their areas of focus. Consumption provides the raw materials needed by the right hemisphere of the brain to generate insights. Using the words of cognitive researcher Edward Bowden, Gannett noted that the “flashes of genius” that we tend to view as inexplicable and unattainable are actually a normal cognitive process, but with “a surprising result.” Consumption also enables us to identify the familiar elements that go into determining what the audience wants. As an example of the importance of consumption, Gannett pointed out that, contrary to the misperception perpetuated by “Amadeus” that Mozart was able to begin composing his immortal works as a mere child as a result only of innate abilities, he actually didn’t compose his first work until age 17, after 14 years of harshly enforced (by his father) daily training and practice. The marketing expert also stressed that “imitation is a huge part of creative learning.” Great creators practice “the careful observation and recreation of the structure of successful creative work,” he said. Gannett has dubbed this “The Franklin Method,” after a lesson from the life of Benjamin Franklin. As a young man, Franklin methodically turned himself from a bad writer into a powerful one by analyzing an article that he admired from The Spectator magazine, outlining the elements that made it work, using the outline to write his own take on the article, deconstructing his own work, and creating a new outline for success based on his learnings. “Imitation allows you to learn the familiar or baseline structure, so that you can then focus on the novel twist” — resulting in something that achieves that sweet-spot balance of familiar and novel, he said. There’s no better example than memes — those viral images that are an unprecedented phenomenon born of the internet. Gannett, citing the “rise and fall” inherent in trends, as a result of The Creative Curve, also stressed the importance of paying attention to timing. In large organizations, in particular, it may take so long to develop a twist on a trend that it’s not released until the core trend is about to start precipitously losing popularity.